Shiv Sena’s Kerala unit threatened to stage mass suicides if women in 10-50 age group were granted permission to enter Sabarimala temple in the state. On Saturday, the Shiv Sena said that its women members will be part of the suicide group which will gather near the Pamba river on 17 and 18 October. “Our women activists will gather near the Pamba river on 17th and 18th October as part of a suicide group. When any young woman tries to enter Sabarimala, our activists will commit suicide,” said Peringammala Aji, a senior leader of Shiv Sena Kerala. Aji said that the “suicide squads” had men and women above 50. 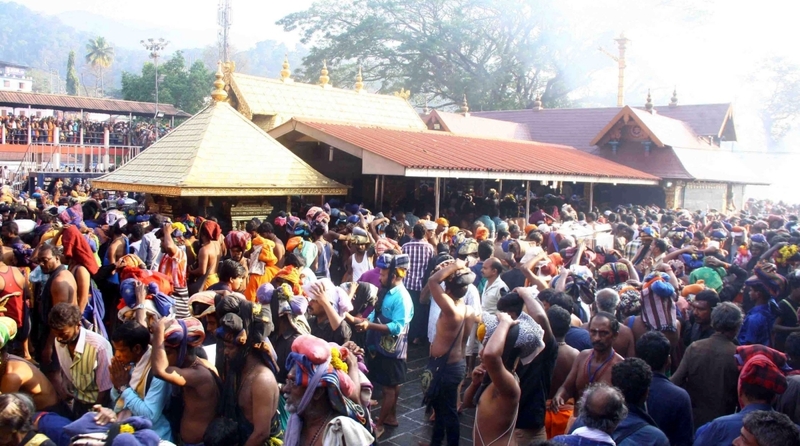 He said that Shiv Sena members will be stationed at various places in and around the Sabarimala temple to check that no woman between the previously restricted age group enters the temple. The temple doors will open on 18 October for its routine monthly pujas. Earlier today, gender equality activist Trupti Desai said that she will visit the temple shortly but did not specify a date. The Kerala government led by Chief Minister Pinarayi Vijayan has so far refused to file a review petion against the 28 September Supreme Court verdict that scrapped the age-old tradition practise of not allowing women of menstruating age between 10 and 50 years into the Sabarimala temple. Meanwhile police in Kollam registered a case against actor Kollam Thulasi for his speech at a protest rally against the apex court ruling on Friday in which he said that women coming to Sabarimala should be “ripped in half”. “One half should be sent to Delhi and other half should be thrown to the CM’s office,” he said. Later on Saturday, Thulasi apologised for his remarks. “It is due to my deep devotion to Lord Ayyappa I said like that. But I later understood as a celebrity I shouldn’t say like this. I wholeheartedly apologise for it,” he was quoted as saying by ANI.